Today is a day one. Of what you ask? Well that answer begins with the book I'm reading. 7: An Experimental Mutiny Against Excess by Jen Hatmaker. Dude. Check.It.Out. Life changing. The concept is that to break out of a cycle of selfishness and consumerism the author chooses to abstain from or drastically reduce an area of her life, one area a month for seven months. Month one she ate only seven foods, month 2 she wore only seven items of clothing (not counting under garments). Month 3 she gave away over 1,000 items from her home, some to organizations but a lot to people, she prayed intentionally for the Lord to show her who to give what to and he did (I sobbed through that chapter). And that's as far as I've read so far. But it's a GREAT book. But I'm not doing that. 1. What in my life if taken away would alter my value or identity? 2. What causes an unhealthy change of attitude or focus when it becomes threatened? 3. What is the thing outside of God that you put everything on hold for? I thought about these question for a long time trying to see what in my life they pointed to. And I couldn't think of anything. I'm not saying I'm perfect, trust me, or that I don't have idols in my life. I just couldn't think of something that convicted me. I kept saying things and didn't feel the stir of the spirit go "yeah, THAT". Until I thought "Maybe....makeup?" If you know me you know I love makeup. Obsessively. I have TONS of it. I once did a rough calculation and somehow I have accumulated over $3,000 worth of makeup. Now to be fair, I ignore the supposed shelf life of my personal makeup. I have eye shadow palettes that are five years old. So this has been amassed over years. Secondly a significant amount of it was bought with gift cards (a Sephora gift card is the way to my heart) or bought for me as a gift. So I didn't spend that much on makeup straight up. 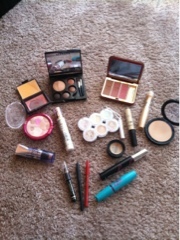 But I still own all of it, am still known as the person to get makeup for, and did spend a lot of my own money. I really believe there is a transformative power in makeup, more than just physically. When you like how you look you feel good and that eeks out into your whole life. Its not just makeup, it could be shoes that make you feel pretty or tall or fast, or a suit that makes you feel accomplished or powerful it successful. Sometimes it's as simple as mascara. And sometimes it's as intense as a full on MAC makeover. But we all have things we do to make ourselves look good and it makes us feel good and there is nothing wrong with that. Cut to my $3000 worth of makeup. In relation to the questions posed I realized a few things about myself and my love of makeup. I use makeup to control how people perceive me. Because I WANT to control how people perceive me. I use makeup to compensate for the fact that I don't believe I'm pretty enough (deep seated issues going back to elementary school, we've all got 'em). 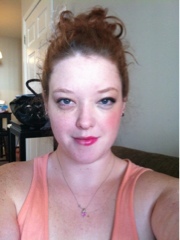 And I use makeup as a status symbol ("why YES this is a $26 lipstick"). "Except concealer cause I'm broken out right now and of course my under eyes are an issue so one thing of concealer to be used JUST on pimples and under eyes. And of course mascara because I have no eyelashes otherwise. I'll look so pale...andcream blush cause I don't normally use that and can add just a touch on my cheeks. I'll take good care of my skin and use lotion and stuff...I should keep in my liquid illuminator, just to add a few drops to my lotion for a little glow. 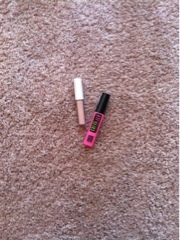 And a tinted lip balm and one gloss. A colored pigmented gloss. Although would I really want to do this this month? My anniversary is this month. Although we're not going out, well be [insert place] that weekend.....with [name] and [name].....do I really want [name] and [name] to see me sans makeup!?! I don't think I can handle that-"
At which point in started to legitimately feel panicked. I realized that although I love makeup there's nothing wrong with that, there is something wrong with using it (or anything else) as a crutch or a means of which to bandage issues instead of deal with them. And there's something wrong at becoming panic stricken at the thought of others judgements because your shield I makeup was down. So there you have it folks. Today is day one of my 30-day Makeup Free Challenge. And by "makeup free" I mean "reduced makeup". For the next 30 days I will be on restricted makeup, and completely abstain from makeup shopping, makeup testing, or looking at makeup looks (I do this one a lot), all this in an effort to deal with some of my issues and let God show me a better use of my love, time, and money.